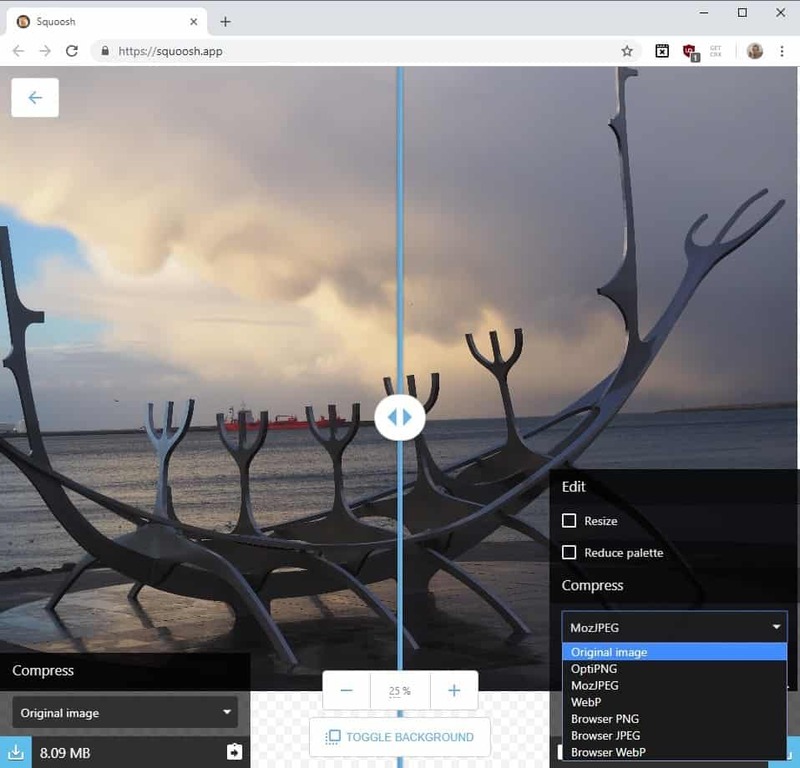 Google's Chrome Developer Conference is in full swing and one of the things that came out of it yesterday was the official unveiling of Squoosh, an online service designed to showcase new browser capabilities. Squoosh is an online image converter at its core that converts images that you load into different image formats. While that niche is very crowded already on the Internet, Squoosh has not been designed as a competitor but as a showcase for new web technologies. The service works in several modern web browsers and not just in Chrome; I had the impression that it runs faster in Firefox than it does in Chrome when I ran side-by-side tests. Squoosh takes a source image and converts it into one of the supported formats. The process is automatic and it happens locally after the initial download of the application in the browser. The app supports the formats OptiPNG, MozJPG, WebP, and Browser PNG, JPG, and WebP. A slider separates the image into the original version and the converted version on the page. You may move the slider and use zoom in and out operations to compare the quality of the input and output. It is easy to switch to a different format and make changes to the parameters of it. Just click on the format selector and pick a new format: the app converts the image to the selected format and display it immediately in the preview area. Options to resize the image or reduce its palette are provided independently of the selected format. Some formats support custom parameters that you may adjust. If you select WebP for example, you may check the lossless box, modify effort and slight loss parameters, and check the preserve transparent data and discrete tone image boxes. Other formats, e.g. MozJPG, offer even more options to customize the ouput. Squoosh highlights the savings (or not) whenever you make changes to the configuration. A click on the download button saves the converted image to the local system. Squoosh is an open source tool by Chrome Labs. The app works in desktop and mobile browsers, and collects some data using Google Analytics. The GitHub project page states that it collects the original and processed image size rounded up to the nearest Kilobyte and "basic visit data". Squoosh is a powerful image converter that showcases the use of new technologies such as WebAssembly. Its practical use is fairly limited at this point in time; while it is a good option to convert a single image to another format, it is not suited for bulk conversions. Users and webmasters who need batch processing capabilities may want to check out Image Batch Processor for Windows, Riot, or File Optimizer. Now You: What is your take on Squoosh? Squoosh is an online image converter by Google to convert images that you load into different image formats in the browser. note that its a pwa that can be installed locally using supported browsers. The problem is that since processing happens locally, it can be really slow when using underpowered computers or mobile devices while processing optipng and webp. I prefer to process a downloaded image with IrfanView, paint.net, and GIMP as appropriate, and finally save it with the Irfanview lossless compressed png plugin. Final quality is of highest priority for me, even though it is a relatively slow process. These kind of optimized image processing (be it lossy or lossless) are meant for webdevs to improve efficiency. Bandwidth costs and storage costs are more important as long as it provides a good enough experience for majority of the users. Also useful for people who store a tonne of images and storage is a premium, but cpu and electricity are not, as they can have smaller lossless files using optipng or webp lossless. I wouldn’t touch it with a barge pole. A Google “service” is a Google data harvester and seller. Thanks gtk. My pref on Win 10 x64 Pro is Nikon’s free XnviewMP. Great batch work, fast, small, customizings. Creates small output like a 3k kb down to 800 kb. The new versions of ACDsee & Zoner can work but bit more extras thrown in for $. All these allow for scaling down output size in a batch. The ISP can determine emailing size limits so helps to have other means like cloud. Guess once improved this Chrome app will be a help in quickie that’s not archival. Been looking at Edge more lately for some general web use. Don’t think much on image side from it yet, but not a priority preferring stand alone image apps. And that’s me out, right there. Particularly for something like this, where there are tons of good native applications that do the same thing but without the spying. its not great, i try to deduced a simple color but takes 2 mins to do anything. its just red color google, not that hard to do.